Pricing can vary greatly depending upon the choices made but I can say that typically my acoustic guitars sell in the $4000-$5000 range. I use a dovetail neck joint and hide glue. All acoustic guitars have scalloped bracing and the tops are tap tuned to bring out the woods full potential. All backs, soundboards and sides are bookmatched solid wood. You can choose Mahogany, Indian Rosewood, Brazilian Cherry, Bubinga, Maple, Myrtle, Padauk, Wenge, Lacewood, Ovangkol, Purple Heart, Zebrawood back and sides. Some woods like Ziricote, Cocobolo, Highly figured Koa, and Malaysian Blackwood require aditional charge. Soundboards are choice, Sitka spruce or Carpathian red spruce. Adirondack spruce, Sinker Redwood, Lutz spruce, Torrefied spurces and other soundboards are optional, prices and avaliability vary. Red spruce bracing is used on all acoustic guitars. The neck is a five piece laminate of Mahogany, Maple and Walnut. The headstock is attached with a scarf joint to make it withstand impact. The body binding is your choice of Indian Rosewood, curly Koa, Ebony, curly Maple, Bloodwood, or Cocobolo. Black/white/black top, back and side purfling on the body is included. Choice of Indian Rosewood or Ebony fingerboard and headcap, and Indian Rosewood, Ebony or African Blackwood bridge. Ebony bridge pins with abalone dots, bone nut and saddle and Ebony end pin with abalone dot is included. Gotoh 510 tuning machines are included as well as a two way truss rod. A hard shell case and lifetime warranty are included in the base price. Changes to nut width, neck thickness, scale length, string spacing, fingerboard radius are no charge. Custom made inlays can be very simple or they can be very eleborate, prices vary. Acoustic pickup + $200 - $500 depending on the system chosen. Many other options are possible, please inquire. (Price quotes given on custom orders are good for 30 days). Solid carved archtop guitars are around $6000. It comes with a suspended pickup that is hand made by Kent Armstrong. Upgrades include: Abalone purfling, Quilted Maple back and sides, sunburst finish, more inlays, Ameritage case. Hand made custom ukuleles are around $1700. I currently make a tenor ukulele model with a 17" scale length. All of my ukuleles have a carbon fiber reinforced neck. 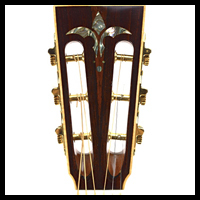 The bracing pattern is a fan brace, much like a classical guitar. Many of the same acoustic guitar options apply for binding and other wooden parts. Gotoh tuning machines and an Ameritage case are included in the base price. A cutaway or a resonator cone are options as well as custom shell inlays. Electric guitars and basses are around $2000. You can also choose the scale length, fingerboard radius, nut width, neck thickness, headstock shape at no additional charge. Upgrades include neck or body binding, gold hardware, Buzz Feiten tuning system, custom pearl inlays, Ameritage case, ATA flight case, Kahler or Floyd Rose tremolo with locking nut, quilted or flame maple drop top, neck through design, semi-hollow bodies, piezo saddles, baratone neck, carve top, active electronics, Fan frets, lighted side dots, on board tuners, seven strings or twelve strings, double necks, custom graphics, Abalone purfling, mammoth ivory nut, etc. There are simply too many options to list.